BINAN, LAGUNA - After an underwhelming performance in Game Two, Mike Tolomia made his presence felt when it mattered most for Phoenix, steering the Accelerators to the 2016 PBA D-League Foundation Cup title on Thursday at the Alonte Sports Arena here. The newly-minted MVP, who was feeling under the weather the last time out, proved his mettle once again and finished with 21 ponts with seven rebounds and four assists to lift the Accelerators to an emphatic 87-78 victory over the Rhum Masters in Game Three. The one-day break between Games Two and Three gave Tolomia enough time to recover and regain his strength, and it worked wonders not only for him but for the team as well. "I'm feeling better ngayon kasi nakapag-dextrose ako at nakainom ng meds," said Tolomia after his team completed a sweep of the D-League titles. In fact, he stepped up for the Accelerators when the Rhum Masters trimmed a 20-point deficit down to three, and helped Phoenix douse Tanduay’s late-game rally. Tolomia, who scored nine in the final quarter alone, made seven of the last eight free throws that put away Tanduay for good. 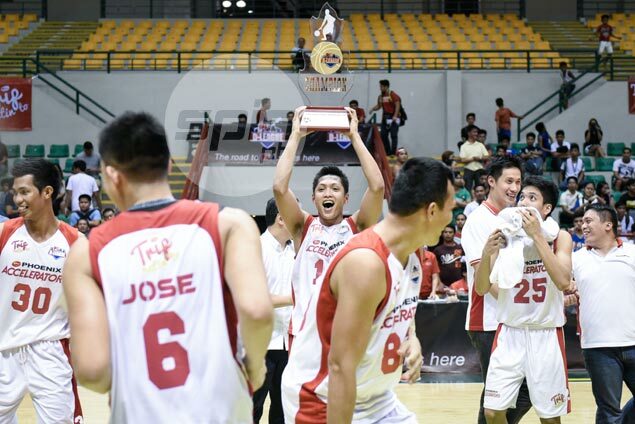 But the former FEU star deflected credit and cited the Aspirants Cup champion's defense as the key to the victory. "Kahit struggle kami sa opensa basta sama-sama kami sa depensa, alam naming kaya naming manalo," he said.